In December, top aides to the president huddled in the White House with some of Scott Pruitt's closest staffers. The message conveyed by the White House: The EPA administrator's idea to hold a public debate on mainstream climate science wasn't going to happen, according to a person who attended the meeting. But that might not be the case. Despite reports from E&E News in December that Pruitt's plan for a "red team" was "on hold," followed by a New York Times report last week that Trump chief of staff John Kelly considered the idea "dead," EPA officials have continued to suggest otherwise. Asked yesterday whether the White House had killed his "red team" plans, Pruitt told Bloomberg, "It's very important that I think the American people have a transparent, objective discussion about this issue. "The vehicle by which we achieve that is something yet to be determined," he added. That came after Pruitt disputed an E&E News story in January that the White House had told his agency not to go forward with the red team climate science debate. "That's untrue," Pruitt told Sen. Jeff Merkley (D-Ore.) at a Senate hearing. "It's under consideration, senator." So did the White House kill Pruitt's red team idea for good? Not exactly, according to sources familiar with the meeting. While White House aides put the brakes on Pruitt's plan, they also suggested an alternative, according to the person in the meeting. Option B: Take public comments on petitions asking EPA to revisit the Obama administration's endangerment finding, the agency's underlying authority to regulate greenhouse gases in cars, power plants and other sources. That would allow EPA to determine "where the arguments are supporting and rejecting the science," said the person at the meeting. It's possible that Pruitt and his aides see that as a way to meet the objectives of a climate "red team," even if it's not the high-profile exercise he touted publicly. Pruitt may also believe the president will support a broader effort despite dissent from his aides. Late last year, Pruitt was frequently pitching the idea of a military-style climate science debate in which a red team comprising critics of mainstream climate scientists squared off against a blue team of researchers. It could even air on television, he suggested. Some conservatives were hopeful that the exercise could be used as a vehicle to challenge EPA's endangerment finding. Trump privately told Pruitt ahead of that meeting that he supported the idea (Climatewire, Dec. 11, 2017). Those plans sparked pushback from the West Wing. "It could not have been more clear" that the red team as envisioned by Pruitt wasn't going to happen, said the person who attended the meeting. And "it was made abundantly clear that General Kelly opposed 'red team, blue team' 100 percent." There were concerns by others in the administration that "Pruitt's concept for red team, blue team would have exposed the administration to litigation risk." The "White House made clear not to use red team as a label," that person said. 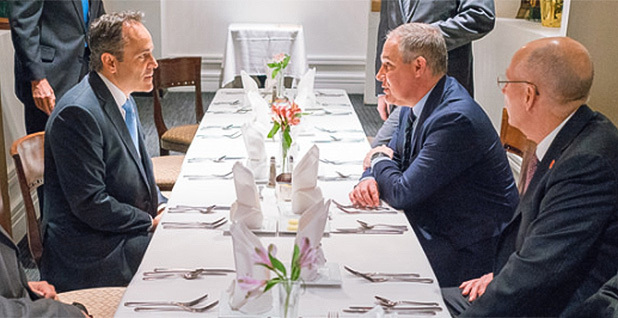 The mid-December meeting was attended by Trump energy aide Mike Catanzaro; deputy chief of staff Rick Dearborn; EPA air chief Bill Wehrum; Pruitt's chief of staff, Ryan Jackson; and others (Climatewire, Dec. 15, 2017). Moving on the petitions to look at the endangerment finding might be a win-win for Pruitt and White House staffers. The petitions fall within EPA's jurisdiction, and acting on them could appease some conservatives who are pushing the administration to upend the Obama-era finding. Pruitt and his top aides haven't ruled out revisiting the determination, although many on the right and left contend that unraveling it would be a massive undertaking that could expose the administration to legal vulnerabilities. "I think it's extremely unlikely that they will try to reverse the endangerment finding," said Jeff Holmstead, an industry attorney at Bracewell LLP who was EPA air chief during the George W. Bush administration. "It would be an extremely heavy lift and could easily be put back in place by the next administration." Taking comment on the petitions would be much easier. A group of homeowners filed one petition the day of Trump's inauguration. Another petition was filed last February by the Competitive Enterprise Institute and board members of the Science and Environmental Policy Project (Greenwire, April 10, 2017). To open a public debate, the agency could simply issue a notice asking for public comment on the petition. The move wouldn't create any obligation for EPA to take regulatory action, and it could score the administration some political points on the right. "We would be happy if the EPA took our petition and the other petitions for reopening or reconsidering the endangerment finding and if they decided to consider those petitions in a public way," said Myron Ebell, director of the Center for Energy and Environment at the Competitive Enterprise Institute. Ebell led Trump's EPA transition team. "Essentially, a red team could be a part of that process, a red team analysis of current climate science could be part of that process, and that would then allow them to make a better-informed decision about whether reopening the endangerment finding is a good idea or not," Ebell added. Conservatives may push for more. "CEI's petition is a good petition, but just opening it up for comments I don't think is enough," said H. Sterling Burnett, a research fellow at the Heartland Institute, which has pushed for the unraveling of the endangerment finding. Burnett said such a move might constitute an "opening salvo" in a process to roll back the finding. "You start somewhere, and if the comments come in strong enough, you move forward with a bigger project." Taking comment on the petitions would open the floodgates to anyone who wanted to participate. "They're going to get an earful from the legitimate scientific community," said David Doniger, director of the climate and clean energy program at the Natural Resources Defense Council. Doniger called an attack on the endangerment finding a "fool's errand." If EPA attempts to do so, he said, "they'll get blown away if they do this both in the court of public opinion and in the court of appeals in Washington." If EPA ultimately seeks to undo the finding, it would have to issue a new regulation, which would certainly be challenged in court. Taking comment on the petitions and issuing a new rule to undo the finding could potentially take years, and some see it as a way for the administration to effectively punt on the issue. EPA could accept comment on the petitions and then let the issue languish. The petitioners could take EPA to court, contending that the agency's inaction constitutes an "unreasonable delay," but lawyers say that would be a tough case to make. Longtime EPA observers point to another climate petition filed during the Clinton administration. In 1999, environmental groups asked then-EPA Administrator Carol Browner to regulate greenhouse gases from autombiles under the Clean Air Act. The Clinton administration sat on the petition for more than a year before opening a 90-day public comment period shortly before Clinton left office in January 2001. The George W. Bush administration rejected the petition in 2003 (Greenwire, Sept. 2, 2003). That rejection prompted lawsuits that led to the landmark 2007 Supreme Court decision Massachusetts v. EPA, which said that EPA has the legal authority to regulate greenhouse gases from automobiles under the Clean Air Act. The endangerment finding has its roots in that legal decision. If EPA opens comments on the endangerment finding, it would be a "paper process" that won't get much attention, Doniger said. "It's just dog whistling to the climate deniers," he said. "It's not going to be a high-profile thing."